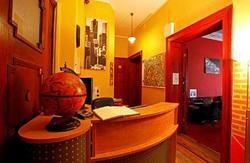 If you are looking for the best accommodation in Wroclaw you should definitely choose Friends Hostel & Apartments. Check why??? - PERFECT LOCATION: We are a perfectly situated hostel, just a stone' throw from the main square. The abundance of pubs, restaurants & monuments will satisfy all our guests!!! - TRANSPORT: In the nearest surrounding you will find direct connections with the airport, main train & bus station. - BRIGHT & COSY ROOMS: We offer different types of rooms single, double, twin, triple, quadr, rooms for five & dorms. The rooms are bright and you will absolutely love our beds. Except the most comfy mattresses in the city, we provide you always clean and fresh bedclothes. Every bed has a big drawer for luggage with a security locker to make your stuff safe. Thanks to Wroclaw's young artists each room has its own character. We assure you will feel like at home. - SHOWERS & TOILETS: We offer modern, ecological and always clean showers. - 24H OPEN RECEPTION: Our hostel is open for 24h. If you need any help or piece of advice don't hesistate to ask our helpful reception team;). We provides you tips, maps and guides for free. Here you can buy also cold drinks and souvenirs. - PINK&GREY COMMON ROOM: After visiting the city you will find an oasis in our common room. The are various ways to chill out. You can choose between watching TV, playing table football, using Internet, spending time with freshly met friends or planning your next day in Wroclaw. - FULLY EQUIPPED KITCHEN: You don't need to take pots, spoons, plates and your microwave - everything is here! In Friends Hostel you will find fully equipped kitchen where you can prepare your meals. Tea & coffee included in price - drink as much as you want/can! After the check out you can leave your bags in the luggage room. FRIENDS HOSTEL IS NOT ONLY BEST HOSTEL IN THE CITY ;) BUT IS ALSO BEST APARTMENTS IN WROCLAW! Specially for our guests we prepared modern apartments located on Wroclaw main square! Friends Apartments means BEST LOCATION, COMFORT & PRIVACY. All of our apartments consist of perfect design living-room, fully equipped kitchen & private bathroom with shower. Book Friends SQUARE, FUSION, MONROE and ROYAL Apartments and enjoy what other can dream about! You can find us in 18th century, historical tenement house on the one of the popular street in Wroclaw - Ruska 49, witch direct you to the Old Town.